It's no secret, pets are often found on the Christmas list to Santa. Sure they teach children about responsibility, and yes, they can actually reduce the chance of your child getting allergies. But at the end of the day, they're just plain fun. As a parent sometimes you just can't resist the "please mom? PLEASE!" call. And that's why you're here? it's time to finally get that furry little friend for your child. This book will give you all the info you need to buy and take care of guinea pigs as pets. 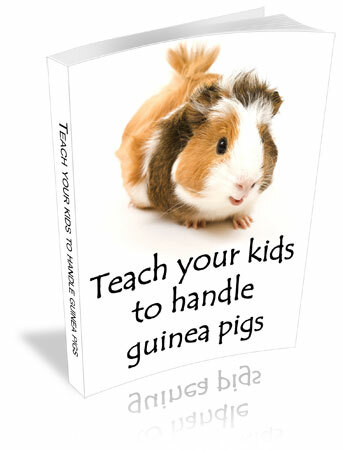 It will help you explain the important parts of guinea pig care to your child. And most important, it will help your little ones understand that guinea pigs are not toys, but living creatures that need to be taken care of. The price of this book is $4.95 and it is an e-book. That means you will be able to instantly download it, as soon as you finish the payment process. The payment is handled by a completely safe E-junkie cart. To read this book on your computer, you will need the free Adobe Reader software. If you don't have it installed, download it here.